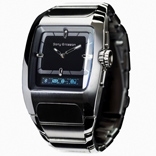 Gain discreet wireless control over incoming calls and the music player in your Sony Ericsson mobile phone with the Bluetooth™ Watch MBW-100. It can be paired using Auto pairing™ if supported in the handset. The watch vibrates when it detects an incoming call, displaying the name or number of the caller on the OLED display. Notifications of incoming text messages are displayed, too. Incoming calls can be muted or rejected by pressing keys on the watch, and tracks can also be played or skipped on the phone's music player. The watch gives a warning vibration if you walk out of range of your handset. Uniquely, the MBW-100 is an analogue timepiece. 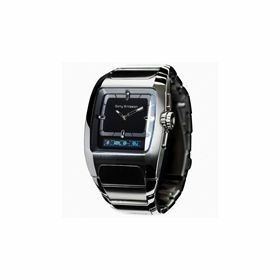 Quartz crystal movements keep exact time in a non-allergic stainless steel and mineral crystal design, giving you the benefit of both cutting edge technological innovation and premium classic watch design.